Cascade Brewing, located in Portland, OR, has been getting attention from around the country for their outstanding sour beers over the past couple of years, but after winning both the Gold and Silver medals in the Wood and Barrel Aged Sour Beer category (Bourbonic Plague = Gold, Vlad the Imp Aler = Silver) they are sure to see some increased focus and demand. Seems like a good time to catch up with Brewmaster Ron Gansberg. Here is a link to my previous “5 Questions” interviews. 1) Congrats on the big win at GABF! For just Cascade’s second year of entering the competition, that is quite an accomplishment to beat out 43 other beers to take both the Gold and Silver medals in the Wood and Barrel Aged Sour Beer category. It must have been pretty exciting. What was it like at the awards ceremony and the rest of the session afterwards? The Wood and Barrel-Aged Sour Beer category was the last one where we had beers entered. As they announced the Bronze medal winner I was thinking, “Oh boy! 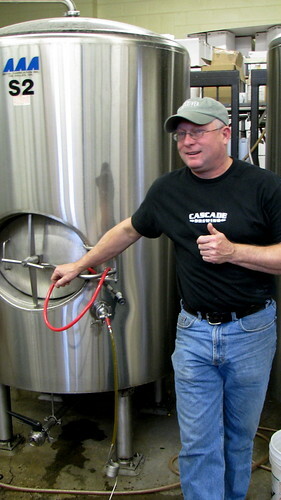 I hope we don’t get shut out.” When they awarded the Silver to “Vlad the Imp Aler”, Cascade Brewing Co. I felt such a flood of elation and relief that I scarcely heard them announce that we won the Gold medal for “Bourbonic Plague”. After we received our medals and had our picture taken with Charlie Papazian, I simply floated around the hall like a lost balloon until, at last, my feet touched the ground again. It is very gratifying to gain such merit and this level of accreditation is vastly important to helping us become known for our products in this style. I had hot flashes for the rest of the session in a whirlwind of questions and congratulations given and taken. Now in reflection, I wonder if I’m not to old for this awards thing, win or lose. 2) Will fans of Cascade in the NW (and Seattle in particular!) have an opportunity to try the Bourbonic Plague or Vlad the Imp Aler any time soon? We have more Vlad the Imp Aler and Bourbonic Plague in barrels that are coming to maturation. That which is packaged is already spoken for. The Seattle Market has seen more Vlad the Imp Aler than even here in Portland. We are receiving a shipment of 40 whiskey barrels on the 5th of October. Most of these barrels will soon be filled with Vlad and Bourbonic and then we’ll all see more of these beers. 3) What were some other highlights from the time you, Curtis, and Art spent in Denver for GABF? Did any Cascade beer make it to the taps at Falling Rock or any other special events? I was most affected by the level of attention and kindness that we received. Brewers, writers, distributors and the general public showed such a great interest in us that it was at times overwhelming. None of our beers were on tap in the city but we did gather all the bottles that we brought in our suitcases over to the Falling Rock for Dr. Bill’s bottle show on Saturday night. I think our time spent with the great people at New Belgium was the highlight outside the festival. 4) I’ve heard rumors of a new location opening up for Cascade somewhere in the SE neighborhood of Portland. Can you give us any details on when this might be happening, and what the location is going to be like? We are opening a second location on 935 SE Belmont. It will be called “Cascade Barrel House.” At this facility, we will be aging over 300 oak barrels of beer, blending, bottling and conditioning all our specialty products. This is a real commitment to our barrel-aged sour beer process. We will have a pub that will serve our specialty and sour beers as well as a few picked guest beers. We will also serve our barrel-aged beers straight through the cooler wall with traditional old brass taps… barrel strength Kriek, Bourbonic Plague from a Heaven Hills Bourbon barrel and Blond Quad to name a few. We want to tap a new beer every week. We are targeting mid to late winter for the opening. 5) When you’re sitting at home relaxing, what beer do you usually reach for? What about when you’re at the brewery? I really don’t know this sitting and relaxing…but as I work around the house I like our Ring Tail Pale. At work I try to sample all the beers to stay aware of how they taste but by preference I drink the Sour Ales. Thanks again to Ron, Art Larrance (owner), Curtis Bain (production brewer), and everyone else at Cascade for turning out some great beers! Thanks to Charles Culp on Flickr for the photo of Ron. gold & silver = congrats Ron!!!!!!!!!! !